Gordon - What game was he supposed to play? Finding a different purpose as well. The house on the hill slumbered. The dark moonless night, chilly with the breath of mid-winter, was pierced by the sound of a sob. The plaintiff cry was carried and wafted on the breeze. Many of the shelf bears woke, their senses alert. Missie outside, gave one short, sharp bark. Sophie the cat on the scratching post tower, sat up. Her ears were pricked. ‘Mew?’ she enquired. Ted settled back and slept. The others closed their eyes. Everything returned to normal. Missie used her night-time vision to scan the backyard in the direction from which she heard the sound. It wasn’t easy. There were lots of tree shadows and indistinct shapes. She barked, as quietly, as a border collie can bark. Joseph woke and said. ‘Shh!’. Missie’s digging dog instincts, were now activated. With furious intensity she scratched away. Soil and leaves flew in all directions. She burrowed through a mud heap and cleared away piled-up leaves and dirt. Underneath was a small ceramic frog, coated with mud and grime with a brass ring welded to his side. ‘Once I held a rain guage, sat on the edge of the garden, and collected rain drops. I had a little solar light which shone in the dark. I was visible. I had purpose and value. Something happened. I was blown down, washed away by storms and high winds. Everyone forgot I was ever here. Now, I’m nothing.’ He sobbed. ‘Tonight, I thought I saw a star through all the leaf-mould and stuff. It was beautiful! The dog ,with border collie intensity, was focussed on her mission and replied with passion and certainty. ‘I’m going to dig you out completely and will then stand you on the lawn. Missie pranced back inside through the screen door and stood in the centre of the lounge room. She barked once, sharply, piercingly and with urgency. One by one bears woke up. Neighbour pushed neighbour into alertness. Fifty pairs of eyes focussed on the dog’s face. Even the two goldfish, the cat and a small panda, on top of a vase were interested in what she had to say. Lots of volunteers quietly interjected with their suggestions. ‘I could play tennis,’ said Tim. ‘I will tell him stories’ said Sam the School boy. Kindness and suggestions flowed freely. Milo was even trying to push out from his top shelf position. ‘I’ll take him a drink of milk’ he suggested. There was an unexpected cough. A voice spoke. Most were unfamiliar with the voice and shuffled forward to see clearly. Gordon the Golfer politely elbowed his way forward, then jumped to the ground from the top shelf. He wobbled precariously but finally regained his footing. ‘Och! I’m Gordon. ‘For themselves who don’t know me, I’m Gordon the Golfer and I’m dressed in unusual clothes. I have something called ‘golf clubs’ strapped to my back. I’m a forgotten ‘nothing’ like our friend outside. I was told when I first came here. 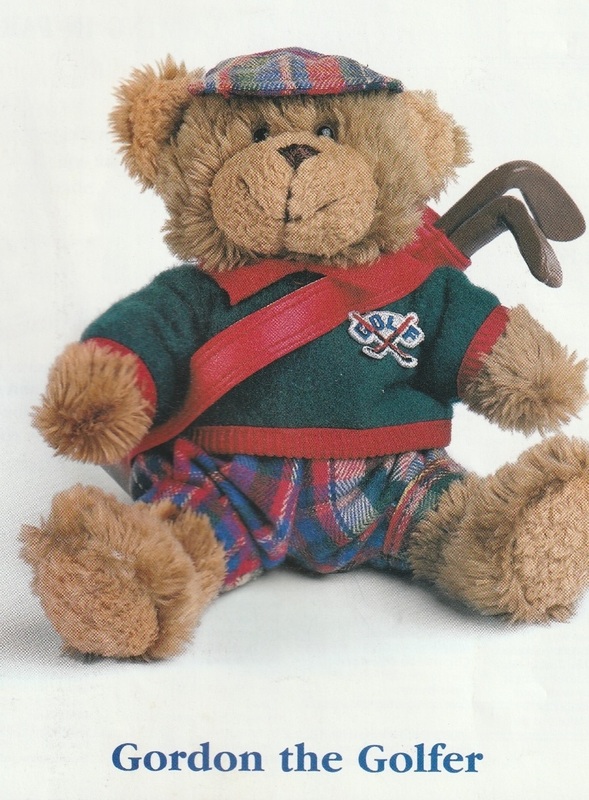 Missie carried the small bear with his golf clubs into the backyard. Gordon hesitated as his paws felt the chill on the ground. Then, he moved towards the huddle on the grass. ‘Yes, the soft voice answered. ‘I’m Pip. An old lady in the shop I came from said she once had a real frog called ‘Pip’. I became another ‘Pip’. He waddled across to the bucket under the back tap. There was a small piece of cloth in a pool of water. ‘Yes’ he called back to the frog. ‘I believe I can.’ The frog now swamped by darkness, was a blur in the distance. Gordon wondered if he was smiling. Gordon grabbed the cloth with his right paw and plunged it into the small pool of water. He shuddered as cold water soaked into his fur and travelled up his arm. He returned to Pip and began sloshing the cloth up and down. He took his time and gradually the dirt and leaf mould dropped off. The frog became clean. Gordon gasped as a beautiful green shine appeared on Pip’s back and the brass ring shone like molten gold. ‘Thank you. Thank you sincerely. It’s been a long time since I’ve felt clean.’ A sob vibrated in Pip’s voice. Gordon shook and flapped his paw around to dislodge some of the moisture. The golf clubs in his back pouch bounced and clattered. ‘I don’t know. I’ve never been on a golf course. The frog said quietly. ‘Why don’t you try while you are out here. You could try hitting it towards me. I….I..I’ve got an idea. If I position my body correctly perhaps you could try to hit a ball into the ring on my side. ‘I’ll go inside and borrow one of the cat’s small balls. She has several.’ He disappeared into the darkness and returned indoors. MEOW! ‘Someone’s taking my blue ball’ MEOW! ‘What’s the matter, Sophie? Have you hurt yourself?’ Mother’s concerned voice came from down the corridor. ‘Don’t get up, love.’ Father’s voice was gentle but insistent. ‘She’s probably having a dream.’. ‘Yes, yes, a dream.’ Mewed Sophie. ‘Back to sleep, everyone.’ She purred loudly. ‘Sleep! Sleep! Everyone back to sleep. Sleep now, sleep now. Shh. Purr! Purr! Purr!Shh! Shh! Shh! Purr! To Ted’s immense relief it appeared that everyone had once more settled and the night returned to a soft calm contentment. Gordon showed the ball to Pip, then waddled to the far end of the backyard. He took out one of the clubs. For a time, he swung it like an axe but finally thought about hitting the ball towards the barely visible shining ring in the distance. The first few hits barely travelled half-way, but Gordon enjoyed every attempt. Pip still could not believe the magic and miracle of this night. He was out in the open under the sky. He watched fascinated as the tiny bear tried his hardest to hit the small ball. He thought he could see shapes lined up at the back-door. It was Gordon who realized six bears had disobeyed the Rule of Protection and Care. They were lined up peering through the screen door. He could identify, Pedro, Pete, Colin, Scott, Sam and the tiny pink Sue Care-Bear. He hit the ball with a mighty and powerful swipe. It travelled across the grass at a terrific speed. It went through the ring! He couldn’t see it but others did. The bears cheered. So much excitement! Caution was overlooked. Bear voices yelled. Bears jumped up and down. The ball continued its trajectory. It could be heard smashing a path through the undergrowth. ‘Back in places everyone IMMEDIATELY’ roared Ted from inside. Missie spiralled out the door in giddy, excited border-collie dance moves. She grabbed him as his golf club crashed back into place on his back. She dropped him on top of Colin who was climbing up to the top shelf. The two teetered but somehow regained their footing and returned to their places on two different shelves. There was a lot of shuffling. It was obvious not everyone could get home before the family got up. Petro’s cutlass was stuck in the carpet. Scott's skis kept sliding off the arm of the chair. Sue was on the floor She simply could not climb up into the arm-chair. Joseph was rying to somehow haul her up as she held onto the end of the t.v. Remote. He slid it over the edge of the chair arm, and she jumped and held on. He tried to pull it back and slide her body onto his lap. It worked, but the remote crashed to the floor. The sound resonated. It hit the floor at an angle and clattered and rolled like a thunder clap. Lights were switched on throughout the house. The pyjama-clad man and woman came running down the corridor. She wrapped her body around the woman’s leg and made plaintive, distressed cat rumbling noises. ‘I’d like to frighten you with my cutlass’ called Pedro who still tried to get back to his middle shelf place. Missie instinctively knew she had to give the bears more time. She would need to distract the whole family. They were all awake. The children were crying in their bedroom, and would certainly soon appear. She assumed her ‘guarding my family’ dog pose and barked urgently with frantic desperation. When the humans were all looking only at her, she sped out the back door and began to run in demented circles round and round the back garden. It worked brilliantly. The family didn’t linger in the lounge room but brought Sophie with them, and charged out onto the back lawn. Pip was totally unprepared. The dog had apparently forgotten he was there in the centre of the lawn. He sat, grateful, for at last being ‘seen’. The humans reacted as if they saw a ghost. One of the children screamed. The beautiful green frog glistened in the dim light. What was attached ,to their startled eyes, looked like a golden or brass supernatural sphere. ‘Just like Star Gate’ father said reflectively. Eight-year-old Emma’s question caused her younger brother to snort. ‘O silly.It would have burnt to crisp when it hit the ground. When Mother spoke, her voice was shaky and sounded shocked. She bent down and fondled the dog's ears. ‘I'm not even going to try to figure this out in the middle of the night’ mumbled Father. ‘Another mystery,in a house that often has mysteries. Let’s leave the frog here for now, settle everyone down again and go back to bed. Only another three hours before down. The lounge room's appearance of frozen stillness returned, but it disguised the lingering excitement permeating the darkness. ‘Today, I was ‘useful’ and I even hit a ball.’ Gordon said happily. Murmurs and rumblings resonated along the shelves. Congratulations and expressions of appreciation rose in volume. ‘This must NEVER happen again.’ Old Ted roared. ‘The dangers of discovery when several of you are involved is nerve-wracking. I’m thankful that there was a good outcome to all of tonight’s activities. However, House Rules will be enforced. ‘Back to sleep everyone! Remember secrecy is the only way we will be safe. There will however always be POSSIBILITIES.